The Headland Villa 4 is a vacation compound composed of two pavilions exemplifying contemporary tropical style. Interiors – with a constant white color scheme – are appointed with mostly superbly crafted urban and posh furnishings and fixtures. Amenities are expectedly of hotel and resort standard – to guarantee sheer guest satisfaction and leisure. 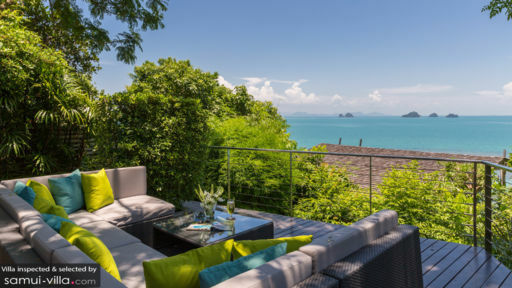 An organic part of the headland rising from Taling Ngam Beach, the Headland Villa 4 accords you upland vacation living with a vibe that’s unmistakably urbane. 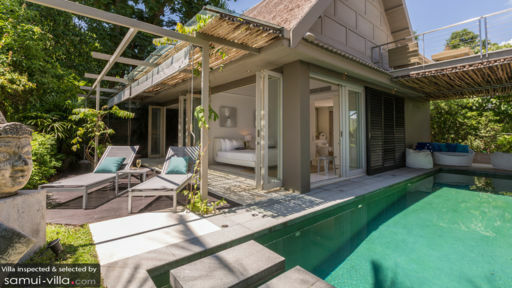 There are three bedrooms available at The Headland Villa 4. The master bedroom located on the upper level and comprises a king-sized bed, TV, and en-suite bathroom. While the other two bedrooms are in a stand-alone pavilion across the main pavilion. One of these bedrooms has a four-post, draped, double-sized bed, and the other bedroom has twin beds. Both bedrooms have dedicated bathrooms with rain showers. These two bedrooms also open out right at the edge of the swimming pool. In between the villa’s two pavilions is the 9.5-meter swimming pool. On impulse, jump into its refreshing, glassy waters – from anywhere you may be in the villa – for some aimless wading, or for some playful splashing. The villa has two living areas. The indoor living area – with its large, angled couches – is at the sunny, airy and high-ceilinged main pavilion. The alfresco living area – with its long, cushioned, woven wood, angled couches – is out on the wooden deck shaded by trees. At any of these living areas, you can all hang out for lively interaction. There are also two dining areas. The indoor dining area – with its timber wood table that seats eight – is at the main pavilion. The alfresco dining area – with its glass-topped table that also seats eight – is out on the wooden deck at the other side of the main pavilion. At any of these dining areas, you can all relish authentic local specialties – as well as Western staples – meticulously put together by the resident chef at the fully-equipped, modern kitchen in between the indoor and alfresco dining areas. The kitchen also has a counter which, provided with high chairs, doubles as a bar for breakfast, snacks, beverages and all kinds of drinks. Tasked to render the villa’s regular services is a well-trained, efficient staff composed of mostly housekeepers and security personnel. In addition to the chef, a babysitter, a driver and a spa therapist may, upon your request, be called in. Their services, however, will be charged separately. Car rental is also available. The Headland Villa 4 is located within the immediate vicinity of Taling Ngam Beach. Ride a traditional, long-tail boat and go island-hopping. On another occasion, go for a big catch at TopCats. Then go nature tripping at the Butterfly Park And Insect Kingdom.